All protein-ligand binding interactions occur in an aqueous environment, therefore predicting the effects of solvent molecules within the binding site is a necessary step in understanding binding affinity. However, the interactions of protein and ligand together with water molecules can have complex and non-obvious effects, which can complicate and obfuscate a lead optimization campaign. 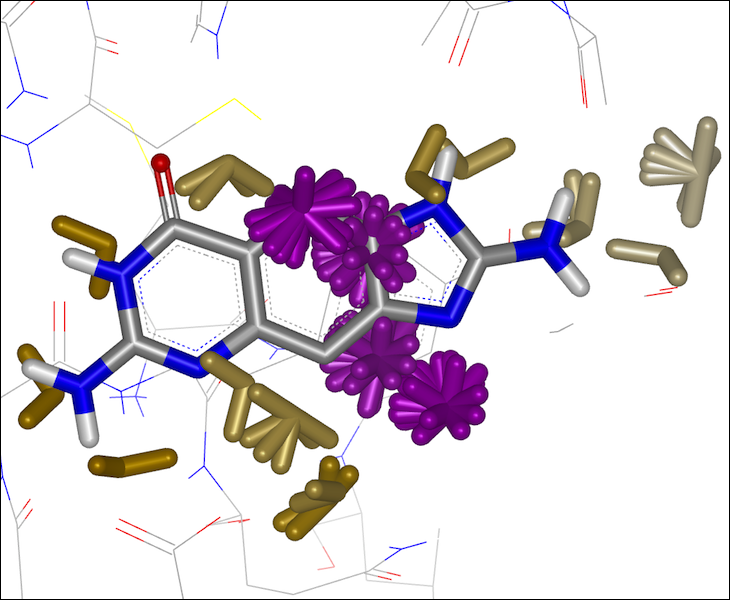 The Szmap TK provides the foundation and functionality underlying the SZMAP application that helps modelers and medicinal chemists understand the role of water in molecular interactions such as ligand binding. Using water as a lens, SZMAP can provide the user with insight on critical features of a binding site, predict where and how neighboring waters can influence binding of a ligand, or generate ligand modification hypotheses designed to better exploit specific regions on a binding site. The semi-continuum [1, 2] approach used in SZMAP combines one explicit water molecule with robust continuum solvent methods , classical statistical mechanics, and thorough sampling plus the ability to analyze specific water orientations. SZMAP calculations identify significant favorable or unfavorable regions of solvent thermodynamics in the binding site. Dominant water orientations are shown, which often match beneficial functional groups on ligands that bind to the protein. Calculation of the thermodynamic properties of aqueous electrolytes to 1000.degree.C and 5000 bar from a semicontinuum model for ion hydration Tanger, J.C., Pitzer, K.S., J. Phys. Chem. 1989, 93, 4941-4951. Continuum based calculations of hydration entropies and the hydrophobic effect Rashin, A.A., Bukatin, M.A., J. Phys. Chem. 1991, 95, 2942-2944. A Smooth Permittivity Function for Poisson-Boltzmann Solvation Methods Grant, J.A., Pickup, B., Nicholls, A., J. Comp. Chem. 2001, 22, 608-640.